Walks in 1066 Country: Walking in East Sussex Guidebooks: Trailguides publish Running, Walking and Mountain Biking Guides to Northumberland, Durham and North Yorkshire. The 1066 area is one of the most beautiful in the South East, and absolutely steeped in history. Yet to many people 1066 simply means the Battle of Hastings, Battle Abbey and all that, and they are quite unaware of the superb scenery throughout the area. Picturesque towns, quaint hamlets, magnificent castles, Anglo-Saxon and Norman churches, oast houses, windmills, ancient woodland, rivers, stunning valleys and cliff top paths .... hard to believe that all this is contained within a relatively small area, just waiting to be explored ! In this series of 14 walks, the author uses his considerable local knowledge to offer a rich choice of routes spread across 1066 Country which should enable you to enjoy this magnificent countryside at its very best ! A wonderful book if you enjoy walks in the country. Well written and easy to follow by the descriptive directions. Gorgeous photos of the area throughout. I can recommend the Stevens crouch walk and the guestling walk, even done as a run instead of walk. In this series of 14 walks the author uses his considerable local knowledge to offer a rich choice of routes spread across 1066 country which should enable you to enjoy this magnificent countryside at its best. Each walk includes detailed practical information for planning, precise route instructions, a sketch map and background information. There are also numerous colour photographs throughout the book. David & Lynda Russell like nothing better than to get out and walk, which isn’t as simple as it sounds. It takes a bit of know-how, and a good book too. Walking is a popular leisure activity in Hastings and we are fortunate to have at least four active local walking groups. 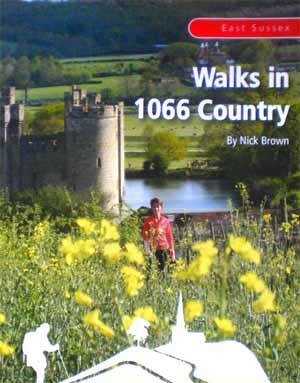 This newly published guide to ‘Walks in 1066 Country’, by Nick Brown is the latest contribution to the subject and features a variety of mapped walks suitable for most abilities. Nick’s guide contains 14 circular walks ranging from 3 to 8 miles in length and all within at least 30 minutes drive from Hastings. (Nick states 20 minutes, but we must be slower drivers than Nick). Some starting points are accessible by public transport and will appeal to the non-driver. Each walk has a simple sketch map and several colour photographs. Many of the walks are updated routes of old favourites and all of them are in well established local walking areas from Bodiam in the north and across the county from Herstmonceux in the west to Rye on the Kent border. Each walk has a short introduction and some historical content but information on local wildlife is limited. More wildlife information would be welcome for example, on Walk 9 around Camber Castle and the nature reserve at Rye Harbour. On the other hand there is plenty of practical detail giving directions from Hastings, parking, level of ascent, pubs, cafés and advice for dog walkers. We tested two of the walks in the book. The first was a short walk of 4.2 miles starting at Battle Abbey described as easy. Most of this walk is on flat sections of the popular ‘1066 path’ and consequently there were dozens of other walkers including several families. Nick’s directions were easy to follow although a few of the paths were overgrown and some of the styles were in need of repair. In this typical Sussex landscape woodpeckers were hammering away in the woods and some very large fish were jumping in Farthing Pond. (I hour 40 minutes). The second walk tested was number 13 from Brede rated by the author as testing. This is a beautiful route taking in the Tillingham Valley and Broad Oak. Nearly six miles in length it took all of two hours fifty minutes including reading the directions and notes. We can’t remember the number of walking books and guides we have read over the years but we are aware that different authors often provide very different descriptions and directions for the same walk. Nick Brown’s descriptions however, are generally accurate and easy to follow. As a precaution we always carry an OS map on which we have traced the route beforehand. We didn’t need to use either the OS map or the sketch map on either of the walks although we missed not having compass directions when crossing fields. Walkers under the age of thirty-five may find it confusing that distances are given in yards rather than in metric. There are other walking guides to the area and further afield in East Sussex there are more. We are however, enthusiastic to explore all the walks in this new guide, which is a good recommendation.